The MetaTrader platform is the most popular trading platform among Forex retail traders. It is the first option when it comes to a trading platform to use and this is because it is highly intuitive, not changing in time and extremely easy to use and master. There is virtually no Forex broker that is not offering the MetaTrader to their clients. The few ones that do not offer it, are having their own trading platform built in-house, but this is quite an expensive thing to do. Like any trading platform the MetaTrader allows for charting to be done, expert advisors (robots) to be built and run, and it can incorporate any technical indicator. There is a strong community behind the MetaTrader platforms that allow for constant improvements to be made. The MetaTrader comes in two versions: the MetaTrader 4 and 5. To the surprise of many, the MetaTrader 5 is not the preferred version! It has been built because in some parts of the world there are restrictions that need to be followed by Forex brokers and traders as well. To give you an example, in the United States, it is not allowed to hedge a position in a trading account. Hedging refers to the possibility to open a long and a short trade on the same currency pair at the same time. In most of the world traders can hedge positions, but not in the United States. Moreover, still in the United States, trades must be closed under the FIFO rule (First in First Out). Such restrictions lead to the development of the MetaTrader 5 version and these are the main differences between the two versions: the first one allows hedging and has no restrictions what so ever, while the other one is the version to be used in the United States and other parts of the world that impose trading restrictions. It all starts with opening a trading account. After that is done, in a process that usually takes around two business days or less (depending on the Forex broker), traders receive an email with the trading account number and password. The MetaTrader 4 trading platform can be downloaded from the broker’s website and with the credentials received, traders can log in. The moment this is done, the platform is connected to the Forex market and trading can begin. The market watch is the actual Forex dashboard. To be more exact, not only the Forex currency pairs are listed here, but also other financial products the broker offers, like CFD’s (Contracts for Difference), commodities (gold, silver, oil) and/or indices (Dow Jones, SP500, Dax, Cac40, etc.). When markets are open the market watch is a lively feature in the trading account as all the financial products listed there will move and quotations will change instantly. From the market watch trades, can be taken by simply clicking on a currency pair, choosing the volume to be traded, and then the direction. 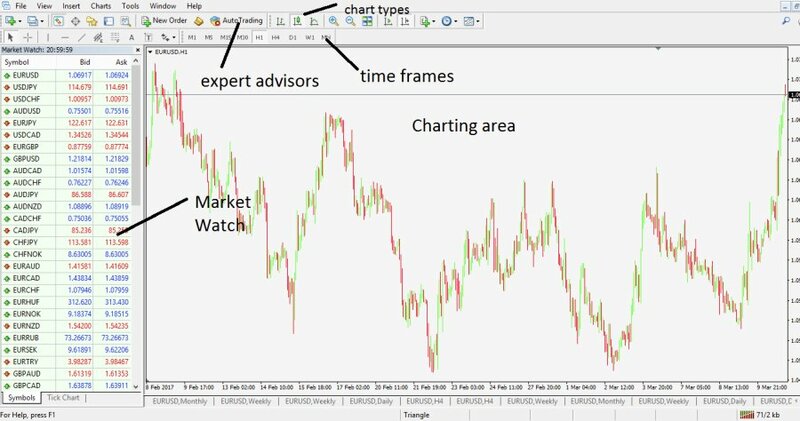 Still from the market watch, if one makes a right click on a currency pair and chooses the Chart Window option, the platform will open a chart in the charting area displaying the currency pair and the time frame selected. The time frame can be changed with the possibility to choose from lower ones like the one and five-minute time frames, to bigger ones, like weekly and monthly. The charting area is the biggest area and here is the place for technical analysis to be made. Charts can be easily customized, starting with basic stuff like the background color and the color of the candle, end ending with the type of the chart to be displayed (line, bar or candlestick) and the studies to be applied. The Auto Trading tab allows for trading robots or expert advisors to be placed on a currency pair. A trading robot is a program or a piece of software that is buying or selling when the market is open based on specific instructions. Most of the robots are built on technical analysis grounds, like opening and closing a position if specific levels are reached, or if certain things are happening. Such things can be the cross of two moving averages, a divergence between price and an oscillator, etc. If the Auto Trading tab is not pushed, the robot will not take any trade, even though it is applied to a chart. If it is pushed and all the settings are correct, a small icon will appear on the top right of the chart showing a smiling emoticon, as a sign that the robot is up and running. Under the Insert tab, a bunch of trading instruments is to be found. One can insert trend indicators or oscillators, use Fibonacci trading tools (retracement, expansion, time zones, arcs), or can look at the custom indicators list. The custom indicators are the ones that are imported in the trading platform and are not there with the default settings. Only the most popular ones are included, but virtually any indicator, strategy, robot, etc. can be imported and the trading environment therefore customized. Balance. The balance is the amount of money or the funds deposited, plus the result of the closed trades. If trades are profitable, the balance will increase. If not, it will decrease. Equity. The equity in a trading account is THE thing that matters. The equity will constantly change, show the true value of the account. Unlike balance, equity will reflect the remaining buying or selling power of the account. Free Margin. Forex trading is leveraged as this is the only way for retail traders to access the interbank market. The more free margin in a trading account, the better and safer for the trader. These are only a few things to mention about the possibilities the MetaTrader platform offers, and the rest of them are easily found when it is used. It is not by chance that the MetaTrader is the most popular trading platform!